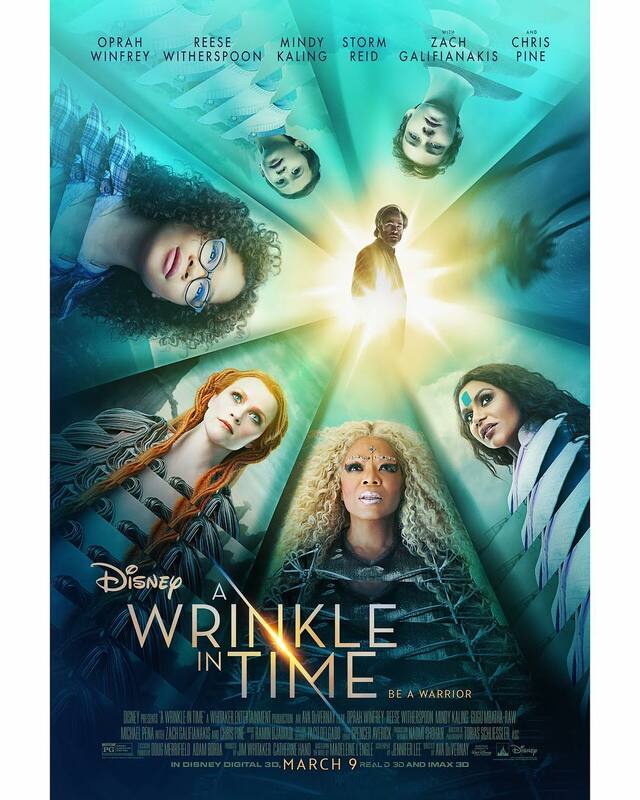 A Wrinkle in Time is the latest film adaption of the book by the same name by Madeleine L’Engle, which was first published in 1962. It has been four years since the disappearance of Meg Murry’s father, Alex (Chris Pine), an astrophysicist. When Meg (Storm Reid), her intelligent younger brother Charles Wallace Murry, and her fellow classmate Calvin O’Keefe (Levi Miller) discover that Alex is still alive and being held captive in Camazotz by an evil called IT, they will do anything to get him back. They have the help of three astral travelers, Mrs. Which (Oprah Winfrey), Mrs. Whatsit (Reese Witherspoon) and Mrs. Who (Mindy Kaling). These mysterious beings of the universe open Meg’s mind up and take her and her friends on the journey of a lifetime. The visual effects in the film are absolutely incredible and dazzling. It is such a surreal film, taking place in a world where nothing quite makes sense. Meg’s journey through space, to different dimensions and places create a visual masterpiece. It entrances you almost hypnotically and pulls you into a spiral of colors. The child actors, including Storm Reid, Deric McCabe, Levi Miller and Rowan Blanchard all did fantastic jobs acting especially for their age. The movie did seem slow at some points and fast in others. There wasn’t much buildup for the climax and it all happened in a couple minutes. Not all characters were given a detailed background. We didn’t truly get to meet Mrs. Which or Mrs. Whatsit or Mrs. Who. The novel goes into greater detail and lets us establish a connection with these characters, but the film falls short in this aspect. Calvin, Meg’s classmate, also doesn’t play much of a role. In fact, in one of the scenes, he disappears and you don’t see him again until the resolution. He doesn’t contribute much to the movie and it was very disappointing to see a character like him go to waste. However, the film is a way for children to discover themselves. They realize that to be a good person, a hero, you don’t have to get rid of your faults. Instead, you can accept them. Director of the film Ava DuVernay made a surprise appearance before the film, telling the audience to imagine themselves as 8-12 year olds while watching. She hopes that the movie will be a source of light in a time of darkness. Through Meg’s adventure, children are invited to open their eyes up and accept who they are; there is no reason to change yourself through pain and through evil. Through Meg’s battle against IT in Camazotz, she learns love and acceptance can overcome many evils of the world. This movie will definitely resonate with many children and leave them inspired and in awe. “A Wrinkle in Time” will be in theaters March 9.